A well put-together booth at a conference or convention is the best way to get attention for trade shows. Standing out amongst the rest will get you the traffic you’re looking for and the potential leads. Finding top-quality flooring that draws people in isn’t hard. Digital carpeting offers a comfortable flooring that gives an anti-fatigue feature that benefits you, your staff and visitors to your event booth. Most trade show centers require you to lay down trade show flooring anyways, so why not buy one that is strong and portable? 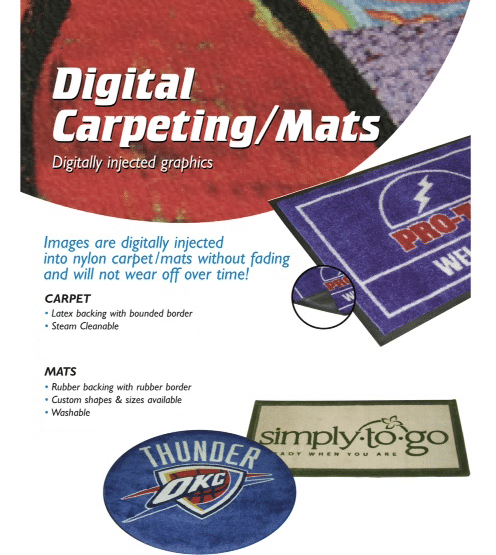 Digital carpeting uses digitally–injected graphics. These images are digitally injected into nylon carpet/mats without fading and won’t wear off over time. They are a durable trade show flooring option for anyone. They have a latex backing with a bounded border and best of all, they’resteam cleanable. You can also get mats; these mats have rubbing backing with a rubber borderand come in custom shapes and sizes. They’re fully washable. Great trade show flooring makes boundaries of your booth clear and helps to disguise any wiring and cords too. They also offer a visitor a place to rest their feet after walking on concrete floors for hours. This digital carpeting also works great in showrooms, retail shops and hotels too. Finding top-quality flooring that is easy to install, easy to store and easy to transport is key. With the help of our large selection, we can help you design digital carpeting that will work best for your exhibition marketing strategy. It will give you years of use and will help you to give off the imagery and impression you’re looking to give at your next event. For more information on digital carpeting options, contact our professional team at Capital Exhibits today!